You're one click away from immersing yourself into the most audacious military operation ever conceived. Jump right into the largest invasion of Europe by ordering our D-Day 70th Anniversary Special Issue! Yes! I’d like to buy this D-Day Special Issue! Operation Overlord (or the D-Day Invasion as it is now commonly called) changed the world forever. It was the most complex, most audacious military operation ever conceived. So enormous was its scope that its outcome was due as much to unforeseen and improbable events as military strategy. And you’re just one click away from immersing yourself in all of it. Inside this D-Day 70th Anniversary Special Issue, you’re guaranteed to see sides of the Normandy Invasion you’ve never seen before. From personal stories to the political struggles, from the men on the beach to the commanders calling the shots, you’ve never read anything like this. Of course, much has been written about the D-Day invasion already. The military tactics, the training of the airborne and the fighting on the beach have all been well-documented. But beyond its large scale, the Normandy Invasion was also one of the most monumental weather-sensitive military operations ever undertaken. As you’ll read in “Mission Critical: Weather,” the meteorological constraints of the mission were overwhelming: Pilots needed clear skies to provide proper air support. Naval forces needed calm seas and mild winds. And the airborne men needed low clouds to conceal their drops from the Germans. How were all these conditions monitored? Inside, you’ll learn about General Dwight D. Eisenhower’s arrival in England months before D-Day to discuss how meteorologists would be incorporated into the planning for Operation Overlord. Extensive monitoring was conducted all across Europe to prepare for the landings. Weather data from the Atlantic was used in concert with ground monitoring in Europe. But as you’ll read, the odds of favorable conditions for most of the Allies never passed 50-50. 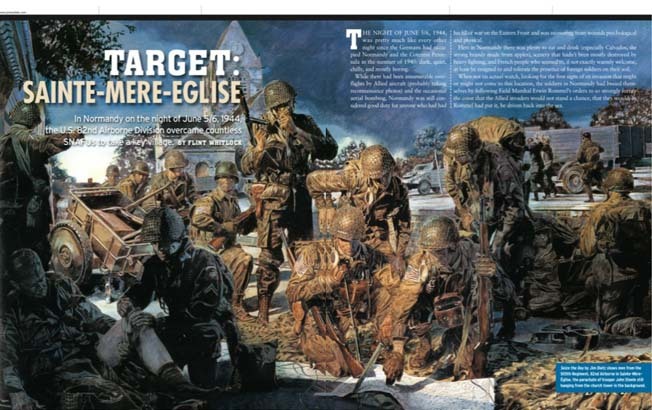 Our D-Day Special Issue will also take you on deck with First Sergeant Len Lomell on LCA 668, as he and his men in 2nd Ranger Platoon cut through the choppy green English Channel in the early hours of Operation Overlord. As the men poked their helmets out of the top of the boat, they were looking at what would be the center stage of one of the greatest and most intense amphibious landings in world history. 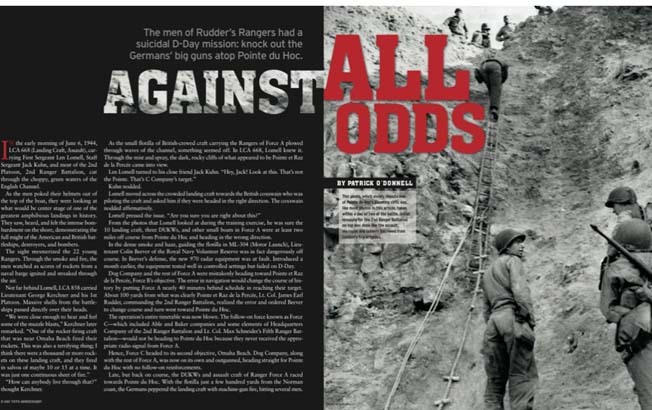 The fighting on the beach was intense enough, but as you’ll read on, you’ll see that the men of Rudder’s Rangers were also given a nearly impossible task: to knock out the Germans’ big guns at Pointe du Hoc. …not just from the Rangers themselves, but also from the Germans. “The American landing craft were coming from the [east] and were fully loaded with men and material. When they arrived, the waves were very hight and the little boats were thrown about violently. Once they hit the beach, the ramps dropped and the men charged out. Were the Rangers successful in completing their mission? What myriad obstacles did they have to overcome along the way? Order your copy today to find out! Task Force Raff was among the near countless groups who stormed Utah Beach on June 6. This small tank force was led by experience paratrooper Col. Edson Raff. his mission was to race up the beach toward besieged Ste. Mère Égalise. Raff’s mission was vital to the success of the D-Day invasion, and he absolutely hated it. As you’ll read inside our Special Issue, Raff was a gruff West Point graduate who had his own ideas about how to enter into battle. America’s most experienced paratrooper, he had led the very first U.S. airborne operation in North Africa, then followed it up with yet another jump in Tunisia. According to him, jumping out of a plane became “like getting out of bed in the morning.” He much rather wanted to be “hitting the silk” into France with the rest of his division. So why was he separated from his men? And how did his relationship with Ridgway affect his place on D-Day? Find out inside! “From Roundup to Overlord,” which explains how COSSAC staff, under Lt. Gen. Frederick E. Morgan, studied every aspect of a cross-Channel invasion of the Continent, and how they eventually chose Normandy for the Allied landing. “Pre-Invasion Bombardment,” in which you’ll learn about RAF and AAF bombers who paved the way for the Allied troop landings on D-Day. “Blue & Gray at Omaha Beach,” which explores the U.S. 29th Infantry Division, a uniquely mixed division made up of northern and southern soldiers who still harbored some Civil War mentalities, who fought their way ashore on the bloodiest of D-Day beaches. “Glider Assault on Pegasus Bridge,” a riveting feature on the bold British glider assault and how they seized a pair of vital bridges in the early hours of Operation Overlord. “‘We’ll Start The War From Here’,” which will set you right beside Brigadier General Theodore Roosevelt, Jr., as he makes his fateful D-Day declaration on Utah Beach. “‘Canadian Fishes’ Storm the Beach,” which outlines the efforts of the Canadian 3rd Infantry Division and the heavy price they paid to sure victory for the invasion. Each of these stories are included in your D-Day special issue for just $9.95. From the bloody fighting on the beaches to the tactical planning behind closed doors, full immersion into the D-Day invasion is just one click away. So order your special issue today! P.S. Was Raff put in charge of the tank division purely as punishment, as he suspected? Or did Ridgway see a tactical opportunity? Inside, you’ll get the full story!